Electronic controls are slowly transforming aircraft engines of all types, bringing improved fuel consumption, improved efficiency, and more power. 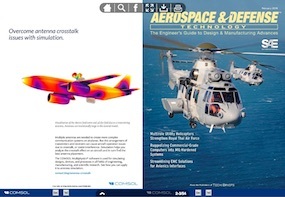 As the functionality of control units for jet engines increases, digital management is also adding more capabilities for helicopters and small piston engines. Modern electronic devices and computing equipment are often integrated with wireless capabilities which utilize multi-bands for high speed communication, as well as high speed circuits and high definition graphical displays that operate at a wide range of frequencies. As such, hardware systems are becoming increasingly complex, resulting in products that are highly sensitive to electromagnetic interference (EMI). The vulnerability to EMI is further heightened when multiple components are packed close together within the device due to space, size and weight constraints. As such, traditional shielding methods that employ materials like thick metal Faraday cages are not always practical due to their heavy weight and bulkiness. Despite its complexity, managing this interference and increasing the resilience of components, interconnects and subsystems within the device is crucial to ensuring reliability and functionality. Pumped two-phase cooling provides a compact, low pumping power option for thermal management in high heat flux applications (300-500W/cm2). Compared to single-phase convection, significantly higher heat transfer coefficients can be achieved at substantially lower flowrates. Two-phase cooling also provides a high degree of isothermality, which is important in many applications such as lasers whose emission wavelengths are temperature-dependent. Communication is key to just about any endeavor. NASA’s ability to update and modify communication capabilities to reflect the latest upgrades without impacts to mission time or a trip back to Earth ensures optimal communication continues. In-orbit reconfiguration for spacecraft radios and systems, including those on the International Space Station, is the goal behind NASA’s Space Communications and Navigation (SCaN) Testbed. From its invention until now, the radio has undergone some mighty technological advances. Conventional or legacy radios are not programmable; they are designed for one fixed configuration. They are built to produce a single waveform at a specified frequency. Conventional radios often also have limited tuning options and fixed data rates. While some conventional radios carry multiple types of data, they are incapable of adapting to new waveforms. To make changes on these legacy radios, the radio would physically need to be changed. Once a radio is out in space, that task becomes nearly impossible to accomplish. These limitations created a need for improved communication in space. In 2008, 4RF Communications started development of a new range of radio products to augment their existing point-to-point, long-range wireless link product. Used by oil, gas, and utility companies for monitoring and control applications, the Aprisa SR is a point-to-multipoint Smart Supervisory Control and Data Acquisition (SCADA) radio operating in the 400 to 470-MHz licensed spectrum band with a 12.5-kHz channel size and narrowband 9.6-kbps capacity. The Aprisa SR is designed to address the key concerns facing the industry, such as the need for enhanced security, the need to efficiently handle the increasing complexity of SCADA networks, and the evolution to an IP-based and smart grid infrastructure. Reducing combat fatalities demands quick and effective emergency care on the battlefield, and all soldiers are expected to provide immediate, basic care to themselves or their comrades. Critical first-aid procedures are described in the Soldier's Manual of Common Tasks, but recalling the procedures in stressful, life-threatening battlefield environments is challenging. In addition, each first-aid skill is composed of numerous, interrelated subtasks and processes. Successful accomplishment of the subtasks and processes depends heavily on an individual soldier's basic aptitude, underlying skills, and understanding of the task flow involved. Most fighter aircraft simulators are fixed-base, with no motion or sustained G-capability. Even those with six degree of freedom (6-DOF) motion bases provide only motion cues and cannot replicate an authentic, sustained high-G environment. While providing useful training for cognitive tasks, and providing some workload and environmental stressors, the devices cannot present the complete spectrum of physical stresses inherent in actual flight operations. Thus, current simulator training cannot effectively reproduce live-aircraft training events such as Basic Fighter Maneuvers (BFM), Air-to-Ground Weapons Delivery, Close Air Support (CAS), Offensive/Defensive Counter Air (OCA & DCA), Carrier Qualification (CQ) Operations, Field Carrier Landing Practice (FCLP), and air refueling. At the U.S. Army Tank Automotive Research, Development and Engineering Center (TARDEC), final testing is beginning on the Ultra Light Vehicle (ULV) Research Prototype platform. The combat effectiveness of a weapon system depends substantially on its hit probability. The most accurate aiming occurs when an optical device is aligned to the weapon’s bore centerline.